Staff could volunteer to take three-day training. 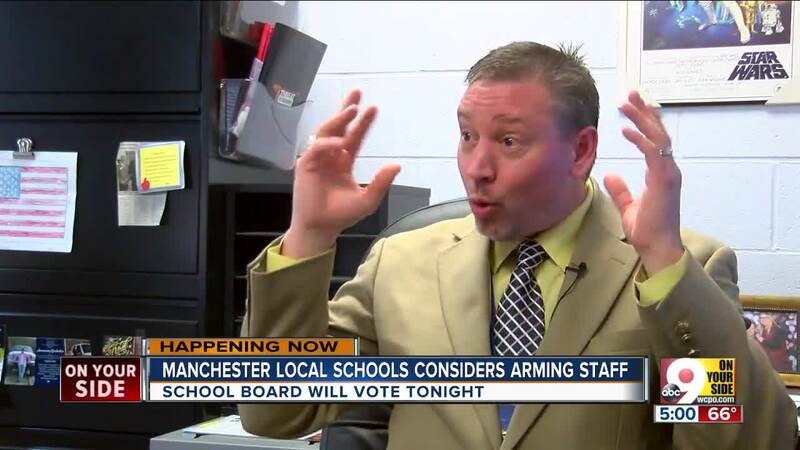 MANCHESTER, Ohio — The board of Manchester Local Schools voted 4-1 in favor of arming teachers and staff in front of a scattered handful of spectators Wednesday night. Superintendent Brian Rau said later he believed the meager turnout was an indication most of the community supported his plan, which would allow volunteer staff members to carry concealed weapons after taking a three-day, 27-hour training course through the Tactical Defense Institute in West Union. Both those opposed to the policy and those in support of it said before the meeting their position sprang from fear: On one hand, the fear of students being vulnerable to an attack by a school shooter in a community far from the nearest emergency responders; on the other, the fear of students being vulnerable to a would-be helper's misplaced shots. Manchester Local Schools' three buildings already have security cameras and bulletproof glass to protect students and staff, but Rau said be believes those measures aren't enough to protect students. Rau said his proposed changes to the school's safety policies would not be immediate — they still need approval from the Ohio Board of Education. He estimated Manchester could see its first armed staff members in 2020.